Home News Which Young Poet will Win The Terry Kelly Poetry Prize 2019? Which Young Poet will Win The Terry Kelly Poetry Prize 2019? Now in its fourth year, The Terry Kelly Poetry Prize, ran at The Customs House, celebrates the life of Terry Kelly respected Shields Gazette journalist. 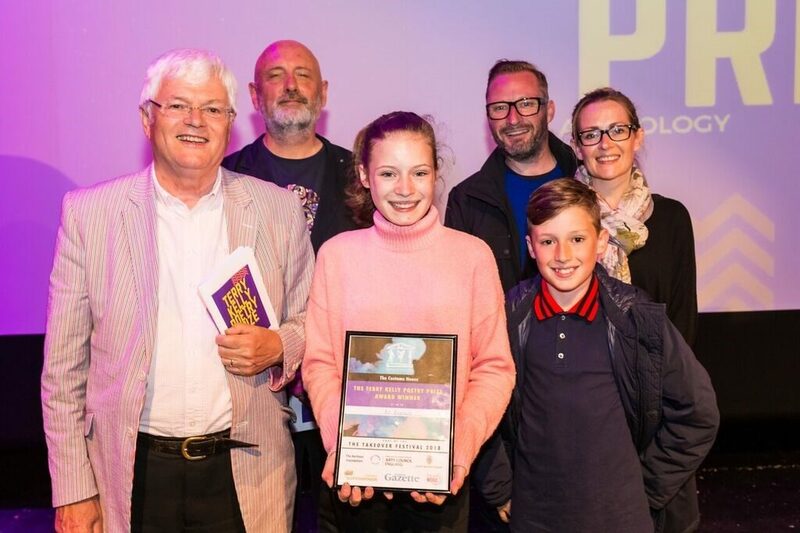 The Kelly family wanted to set up the prize to encourage young people across the North East of England to write their own poems. There are three age categories: Primary; Secondary; and 17 to 25. All shortlisted poems appear in our TKPP Anthology, a published collection of poems. An expert panel of judges decides select the category winners. The Customs House are pleased to announce the judges are confirmed for the Terry Kelly Poetry Prize 2019. Firstly, Terry’s brother poet and playwright Tom Kelly will once again act as head judge. Tom is well known to The Customs House audiences as the writer of The Dolly Mixtures and Geordie the Musical. Secondly we welcome the return of Alistair Robinson, poet and Senior Lecturer in Journalism at Sunderland University and Terry’s friend, who will host the awards evening and help judge. Thirdly, all the way from Scotland Sheila Wakefield Founder/Editor of Red Squirrel Press will once again supports the selection of the winners. Finally for 2019 the Lauren Aspery two times winner of the over 16 category joins the panel. 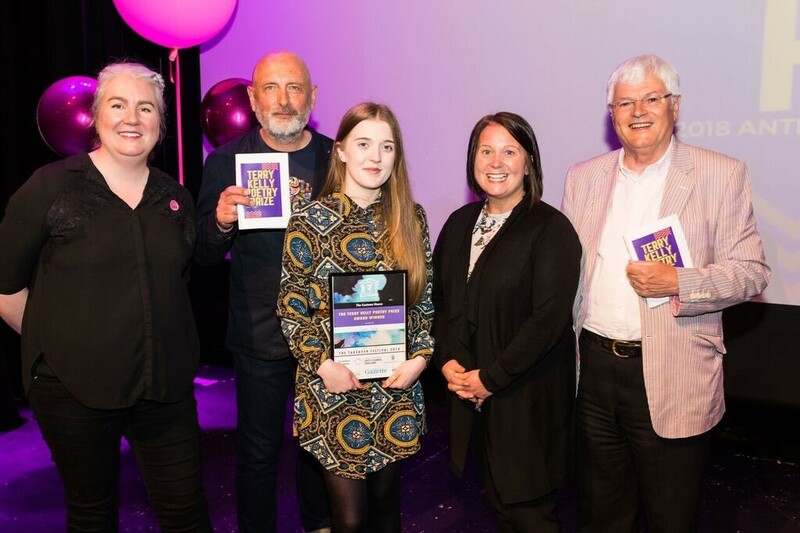 Elizabeth Kane Learning Officer at The Customs House, Alistair Robinson (Host and Judge), Lauren Aspery (winner of the over 16 category for ‘My First Pair’), Heather McDonald from the Scottish Power Foundation sponsors of The Takeover Festival and Tom Kelly. Photo by Billy Amann. If you are still at school, college or university, include the name of your place of study and year group. Indicate if you would be happy to get on stage and read your poem. e.g. ‘Crossing the Tyne’ by Paul Smith aged 11, Patty Smith (Mam), NE33 1ES, Year 6 Tyne Junior School, yes Paul would like to be considered to read his poem. The deadline for poems is 9am on Friday 26th April 2019. Lauren Aspery, Our TKPP Coordinator funded by The Gillian Dickinson Trust, will acknowledge your poem and if you are shortlisted let you know how to reserve you tickets for the awards evening. “Last year we had nearly 50 young poets shortlisted from the whole of the North East take part. We had children from our local primaries and poems from students at Sunderland, Newcastle and Northumbria Universities. Most of our entries in the younger age categories came from people’s families and many of them made it to our award ceremony. In fact last year we had to move the awards to our theatre as the audience was so big. If shortlisted you will receive an invite to the awards on 7pm on Wednesday 29th May at The Customs House. The Terry Kelly Poetry Prize Award celebration event is part of The Customs House annual Takeover Youth Arts Festival. The Takeover Festival takes place from Monday 27th May to Friday 31st May 2019. Winners will be announced at the awards and will receive a certificate, small cash prize and enjoy a joint recording session (please note no cash alternatives are offered). We’d like to thank The Kelly Familiy, The Shields Gazette and our other supporters who make this possible. For more information about The Terry Kelly Poetry Prize contact Elizabeth@customshouse.co.uk. 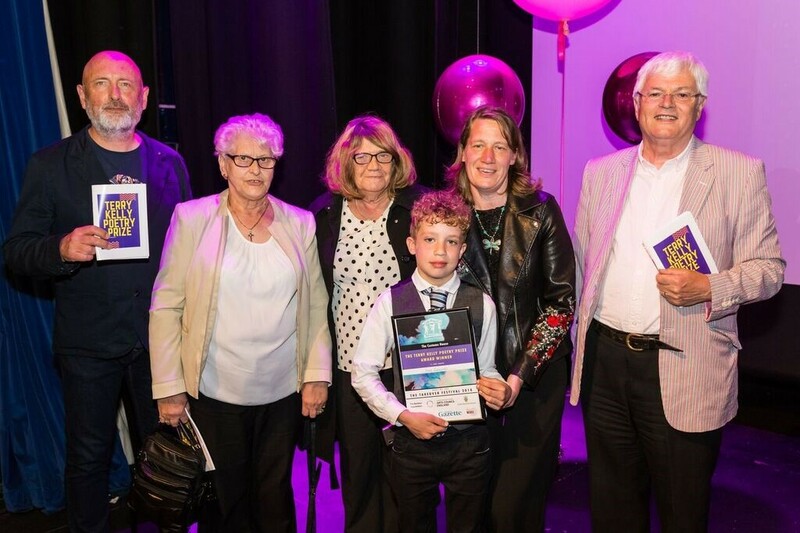 Alistair Robinson (Host and Judge), Finn Edmonds (winner of the Primary Age Category for ‘Why?’) surrounded by his family, and Tom Kelly (Head Judge) Photo by Billy Amann. and the feet are called a tail. Colour is everywhere but that’s alright. Tom Kelly (Head Judge), Alistair Robinson (Host and Judge), Bo Buglass (winner of the Secondary Age Category for ‘This Too Shall Pass’) and family winner of the Secondary Category. Photo by Billy Amann. not wanting time to pass. hoping this moment will never die. everything is still, no movement, no cars. not a thing moving, no noise, no sound. I absorb the clean, fresh air. I feel sad knowing that this won’t last. by in the blink of an eye. Goodbye green grass and moonlit sky. that I was a girl and not a boy. and kick them off with every tantrum. If you do not provide your postcode we will deem the entry ineligible due to the volume of national and international entries received last year. The Terry Kelly Poetry Prize is for young writers in North East England. Young poets can only enter one poem. Please be certain the poem you submit is the one you wish The Customs House to consider. The Customs House make every effort to ensure your work is original. If we suspect plagiarism we will not be able to shortlist your poem. The Customs House can’t accept poems previously entered. Young poets retain copyright of their work but we reserve the right to publish your work in our TKPP 2019 Anthology and use your poem online and in print to promote the TKPP, in learning resources for schools and to publically celebrate your work. Whilst there is no theme your poem should be suitable for all ages. Carefully consider whether you need to use strong or explicit language as this may reduce the chance of your work being selected. We would also advise you try to keep your poem under 30 lines but if a poem is longer and is of exceptional quality it will be considered for shortlisting. If you are a teacher or youth leader and wish to submit multiple entries please ensure all the necessary information is provided. We will email you to confirm which, if any, poems are shortlisted and ask that you pass on the invite to the event to the individuals concerned. We will publish your poem left aligned. Where possible we will not edit your poems except to ensure consistency. The more modern method of writing poems is to capitalise with the punctuation in the poem. In other words, this means when you use a full stop, you capitalise the next letter, proper nouns, and other things you would normally capitalise. This makes poems more easily understood by the reader. Poems will be printed in black typeface on a white background. Why is the Prize Just for Young People? This is in keeping with the Kelly family’s wishes commemorating Terry. We want to encourage young poets to write and enjoy poetry as much as the many fantastic regional professional and amateur writers do. In addition the funding that supports this competition and The Takeover Youth Arts Festival. If you’re over 25 sorry we can’t accept your poems. Tom Kelly was born in Jarrow and now lives further up the Tyne at Blaydon. He has had a varied career from his first job in a Jarrow shipyard Time-Office; to a song writing contract and writing the BBCTV musical documentary Kelly, with Alan Price (of the Animals) and writing songs for a number of artistes including Marianne Faithfull. He has had a great deal of work produced by The Customs House, South Shields, a venue he regards as home, with six full-length stage plays, including I Left My Heart in Roker Park which has won a number of awards and has been produced four times. Tom’s musicals, written with John Miles include: The Dolly Mixtures, Geordie, Tom & Catherine, Dan Dare, The Machine Gunners. In 2016 he was a runner-up in the Journal Culture Awards, in the Writer of the Year category, for Geordie-The Musical, produced by the Customs House in 2015 and reprised in October 2017 at the Tyne Theatre & Opera House, Newcastle. 2016 also saw his eighth poetry collection Spelk published and recently re-printed by Red Squirrel Press. Of late his poetry has appeared in the ground-breaking anthology Land of Three Rivers-The Poetry of North-East England. He was Writer-in-Residence at the Word, South Shields from March to May 2018 where he worked on a number of projects. More recently he has the short story pamphlet The Last Clock Whippet on the Tyne and a short story collection Behind the Wall published by Postbox Press. His play Love Songs premiered at the Customs House in October before embarking on a mini-tour of the region. Alistair Robinson is a poet, musician and journalist. He is a senior lecturer in Journalism at the University of Sunderland, where he runs the BA(Hons) Journalism degree programme. Among his poetry publications are South of Souter, published by Sand in 2003; Stereograms of The Dead, published by Red Squirrel Press in 2009; and The Land Before Yoghurt (Red Squirrel Press 2014). He is working on a new collection, As Blind As Rain. In 2004 he won a Northern Promise Award from New Writing North for his poetry. Alistair is the author of two books on theatre history and one on the history of Sunderland. He plays guitar with the Bicycle Thieves, a jazz trio that performs at venues all over the North East of England and has released Stolen Moments on Road Goes On Forever Records. Alistair’s compositions for that album were published in the USA by Bug Music. For many years he was the Entertainments Editor of the Sunderland Echo. Alistair is married with three children and lives in South Shields. Sheila Wakefield is a poet, editor and publisher. She founded Red Squirrel Press in April 2006 and has published over 200 titles to date, mainly poetry pamphlets and full-length collections. Postbox Press imprint was added in 2015 and publishes literary fiction, short stories, novellas and novels. She has an MA in Creative Writing from Northumbria University and her pamphlet, Limerance, was published by Talking Pen in 2012. Lauren Aspery is an emerging poet and children’s literature-enthusiast from Middlesbrough. She studies English Literature at Newcastle University. Lauren is a two-time winner of the Terry Kelly Poetry Prize 16-25 category with her poems, ‘Home’ and ‘My First Pair’. She has also had her poetic children’s fiction used to engage children in schools and museums in her hometown. Since a young age Lauren has written poetry. While fascinated by traditional structures and forms, Lauren has expanded her work to more contemporary and blank verse. Lauren believes young people deserve recognition for their contribution to the contemporary poetic moment and encourages young people in the North East to do share their poems as she believes poets should not wait for opportunities, but seek them out. The Takeover Open Exhibition – We Want Your Art!